Mail4Rosey: Trying to Conceive? 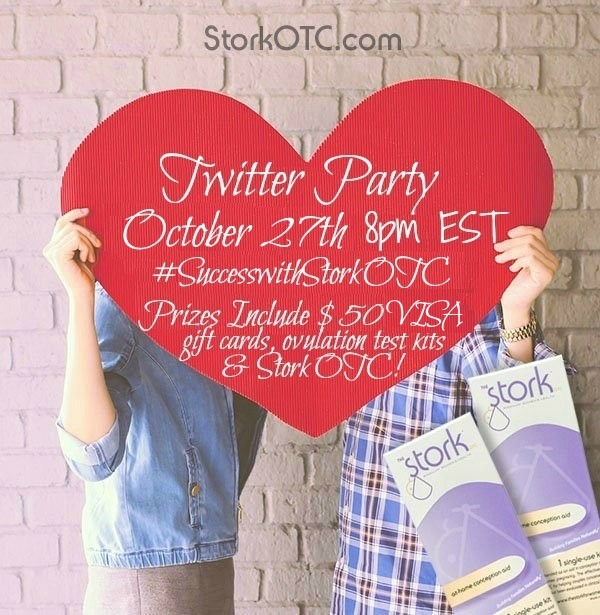 Join Us for the October 27th Stork OTC Twitter Party! Trying to Conceive? Join Us for the October 27th Stork OTC Twitter Party! I remember buying four pregnancy tests every single time I was expecting. Why so many? I didn't want to wait the required amount of time to find out if I was really expecting, but I knew the tests could read negative even if they were positive, simply because I was taking them too soon. Luckily for me, every single time was a positive, and every single time I was ecstatic. Not everyone gets so lucky though, and I very intimately know that to be true. Thankfully there are products available like Stork OTC. for those who need some help. I have family members and dear friends who struggle with various fertility challenges. Some who have been successful and some who are still trying. When a product comes out that might help, it is always, always worth trying. The Stork OTC, available at Walgreens, is one such product. The Stork OTC is a one-time-use device with a trail of success stories backing it. One of those stories belongs to the happy family in the photo up above. 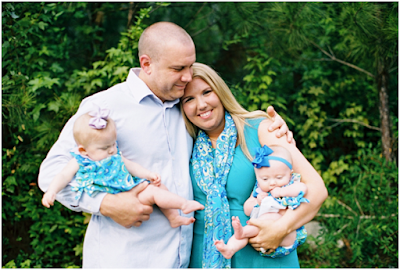 Ashley – TTC 3+ Years, Unexplained, Secondary Infertility. My husband and I have been trying to conceive for 3 years with the help of an RE, after undergoing lots of treatments and tests we fell into the “unexplained” category along with a low sperm morphology count. National Infertility Awareness Week I reached out to review the Stork because I had been reading about it and was intrigued to see maybe if it would work for us and it is definitely more cost efficient. We were averaging $700 a month for IUI and injectable medication versus $80-90 at the store. At first I was a little overwhelmed with the instructions because they were so long and detailed, but once I fully grasped the concept we were good to go. The only downside for us was how uncomfortable the “condom sheath” was to my husband (I have read that some didn’t use it but instead just put the sperm inside of the cup afterwards). On ovulation night we used the 1st stork with the condom sheath and I kept in for about 5 hours, might I add there was no discomfort at all. The next night we used the 2nd stork, this time hubby just put his sperm in the cup and I left it in for about 4 hours. Afterwards, we said our prayers and hoped this might work for us. On 10 DPO we received a super duper faint positive and I almost thought I was just seeing stuff. The next morning, I tested again and saw a faint line and took a digital which said “YES” best word I could have ever seen. I am without a doubt certain the Stork OTC helped us in our long 3-year journey! We went to the Dr. today and saw our baby via ultrasound and just lost it for that we are both forever grateful and thankful to the Stork for helping us in our journey!! I took the picture above of the Stork OTC we received. I thought it might better help you to understand how the device works. It comes with detailed instructions too, that are very easy to understand. I wish each and every person who purchases one, a tremendous amount of good luck. You have all of my well wishes as you continue along one of the most important journies of your life: conception. Want to learn more? Join us Thursday, October 27th at 8pm EST, for a Twitter party! Thankfully, that ship has long since sailed over here, but I do think that it's great that there are products like these that are so helpful to women who are TTC! It is so great that there are affordable products like this to help couples with the goals and starting a family. I'm all done having babies, but am glad to hear that there is something out there for couples who need the extra help. I would love to have more babies. It's on my heart. It's weighty. I pray about it. I suppose it means the husband and I will have to get together too right. My 4th child was a struggle to conceive. This may have help us as we required a iui to finally conceive him. I know a few people who are so I will pass on the info. As for me, I am done! That is fantastic for those couples who need some help. I'll share this post to my friends. I'm going to share this. I know the information will be so helpful to so many couples. I hope many people going through this sort of things find this helpful! I think it's great that they have these tests now. This can help so many people. I am no longer trying to have kids but have friends that have struggled with fertility. This would be perfect for them. When you're in the baby making frame of mind, anything that can help make it easier is awesome. I'm glad this stuff exists. I'm not at this point in my life yet but some of my friends are. I love how it is shaped. It seems like it would be easier to pee on without peeing on your hand. This would be so helpful to those trying to have kids. I got lucky and conceived. I am having my son soon! Last baby for me tho! Thanks for sharing this. I think this is a common struggle and the Stork OTC will help many. As we think about having baby number three, this is a great resource for me! So great that there are more an more products out there to help families. I know of women who struggle with this and will tell them about this product. I love that this is an affordable option for those that can't afford to go to the doctor all the time. This is such a great product. For many couples, TTC can be so stressful. Any help is appreciated, I'm sure. We are done having kids, but I wish they had this when we were trying. It was such a hard time in our lives. I need to share this with my daughter. She's been trying to conceive for 8 years and no luck. She has one child but has been unsuccessful in conceiving again. It's nice to have something like this to help with conceiving, even if it's just for one use. It's definitely more affordable than having treatments all the time. I think it is just amazing when you have such products that could help a couple to start their family life in a better way. Will share this with my cousin who is very much ready to have a baby sooner! This sounds like a great twitter party. I have a few friends who who definitely like this information.